Leukemia, 2018, doi: 10.1038/s41375-018-0102-4. Danusertib (PHA-739358) purchased from Selleck. Mice bearing subcutaneous allografts of conditional patched mutant tumor cells were treated twice weekly with vehicle (saline) or 30 mg/kg PHA-739358. (B)Images of tumors. (C) Tumor weights. Each point represents a single tumor, and grey lines represent mean tumor weights, which were significantly different between vehicle and PHA-739358 treated mice (p < 0.05, based on paired two-tailed t-test). Cancer Res 2013 73(20), 6310-22. Danusertib (PHA-739358) purchased from Selleck. For MTT assays, cells (2,000 ~ 5,000 cells/well) were subcultured into 96-well plates according to their growth properties. Cell proliferation was assayed at 72 hr after treatment of PHA-739358 by adding 20 μl of 5 mg/ml 3-(4,5-Dimethylthiazol-2-yl)-2,5-diphenyltetrazolium bromide (MTT) solution per 100 μl of growth medium. After incubating for 3-4 h at 37°C, the media were removed and 150 µl/well of MTT solvent (either absolute DMSO or isopropanol containing 4 mM HCl and 0.1% Nonidet-40) was added to dissolve the formazan. The absorbance of each well was measured by ELx808 (BioTek, Winooski, VT) or Wallac Victor2 (Perkin-Elmer Life Sciences, Boston, MA) Microplate Reader. Viable cells are presented as percent of control, vehicle-treated cells. Dr. Yong-Weon Yi from Georgetown University Medical Center. Danusertib (PHA-739358) purchased from Selleck. AsPC-1 cells were treated with PHA-739358 (PHA) (3 uM), imatinib (15 uM), or combination of PHA and imatinib for 72 hours and Bcl2 and Bcl-xL expression levels by Western blotting. Biochem Pharmacol 2012 83(4), 452-61. Danusertib (PHA-739358) purchased from Selleck. Western blot analysis of Histone and Aurora kinase. 0-10μM PHA739358 was added. Dr. Zhang of Tianjin Medical University. Danusertib (PHA-739358) purchased from Selleck. The Km values for ATP and the specific substrate are initially determined, and each assay is then run at optimized ATP (2Km) and substrate (5Km) concentrations. This setting enabled direct comparison of IC50 values of Danusertib across the applied kinase selectivity screening panel for the evaluation of the selectivity profile. Method: For short-term expansion assays, 1 × 103 CD34+ cells are plated in triplicates in 96-well plates containing 100 μL of serum-free medium per well supplemented with human stem-cell factor (100 ng/mL), human Flt-3 Ligand (100 ng/mL), human thrombopoietin (50 ng/mL), human interleukin-3 and -6 (IL-3 and IL-6, respectively, both 20 ng/mL), and granulocyte colony-stimulating factor (20 ng/mL) along with Danusertib at the indicated concentrations. After 5 days, an additional 100 μL of cytokine and Danusertib containing medium are added. Cell numbers within each individual well are estimated on days 3, 6, and 9 or on days 3, 6, and 12 for healthy donor samples. Carpinelli P, et al. Mol Cancer Ther, 2007, 12 Pt 1, 3158-3168. Fancelli D, et al. J Med Chem, 2006, 49(24), 7247-7251. Gontarewicz A, et al. Blood, 2008, 111(8), 4355-4364. Alisertib (MLN8237) : Aurora A-selective, IC50=1.2 nM. Barasertib (AZD1152-HQPA) : Aurora B-selective, IC50=0.37 nM. MK-5108 (VX-689) : Aurora A, IC50=0.064 nM. 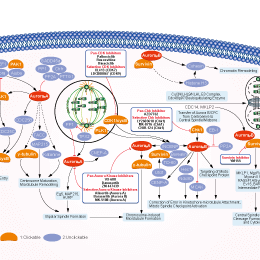 Alisertib (MLN8237) : Phase III for Relapsed/Refractory Peripheral T-Cell Lymphoma. Hesperadin : Potently inhibits Aurora B with IC50 of 250 nM. ML141 (CID-2950007), is demonstrated to be a potent, selective and reversible non-competitive inhibitor of Cdc42 GTPase suitable for in vitro assays, with IC50 of 200 nM and selectivity against other members of the Rho family of GTPases (Rac1, Rab2, Rab7). Alisertib (MLN8237) is a selective Aurora A inhibitor with IC50 of 1.2 nM in a cell-free assay. It has >200-fold higher selectivity for Aurora A than Aurora B. Phase 3. Features:First orally available inhibitor of Aurora A.
Barasertib (AZD1152-HQPA) is a highly selective Aurora B inhibitor with IC50 of 0.37 nM in a cell-free assay, ~3700 fold more selective for Aurora B over Aurora A. Phase 1. Tozasertib (VX-680, MK-0457) is a pan-Aurora inhibitor, mostly against Aurora A with Kiapp of 0.6 nM in a cell-free assay, less potent towards Aurora B/Aurora C and 100-fold more selective for Aurora A than 55 other kinases. Phase 2. ZM 447439 is a selective and ATP-competitive inhibitor for Aurora A and Aurora B with IC50 of 110 nM and 130 nM, respectively. It is more than 8-fold selective for Aurora A/B than MEK1, Src, Lck and has little effect against CDK1/2/4, Plk1, Chk1, etc. Features:An Aurora selective ATP-competitive inhibitor. MLN8054 is a potent and selective inhibitor of Aurora A with IC50 of 4 nM in Sf9 insect cell. It is more than 40-fold selective for Aurora A than Aurora B. Phase 1. MK-5108 (VX-689) is a highly selective Aurora A inhibitor with IC50 of 0.064 nM in a cell-free assay and is 220- and 190-fold more selective for Aurora A than Aurora B/C, while it inhibits TrkA with less than 100-fold selectivity. Phase 1. Aurora A Inhibitor I is a novel, potent, and selective inhibitor of Aurora A with IC50 of 3.4 nM in a cell-free assay. It is 1000-fold more selective for Aurora A than Aurora B. 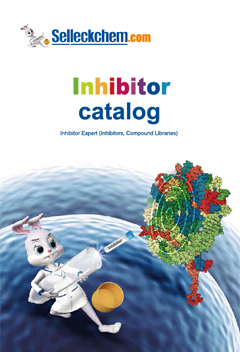 Features:Aurora A Inhibitor I is a novel, potent, and selective inhibitor to Aurora A.